Message Flags with Many Slogans to Choose From! 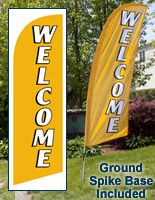 Pre-Printed, Affordable Blade Banners are In-Stock and Ready for Immediate Shipment! The Message Flags Come with a Carrying Bag for Portability! Black nylon carrying case included for transporting the message flags. 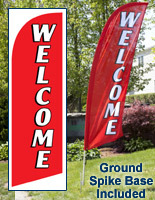 Ground stake base for advertising in front of homes or businesses. 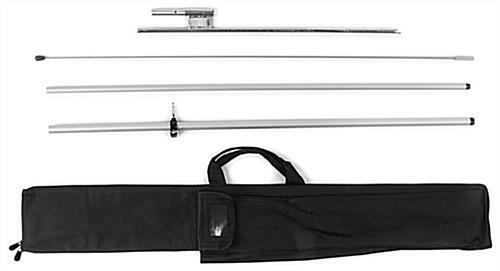 4-Piece aluminum and fiberglass pole is portable and quick to assemble. 8' Height and high contrast color scheme for visibility. 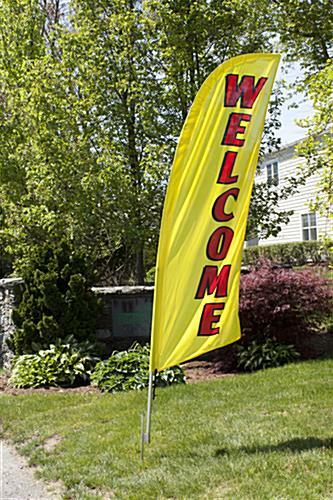 These 8' message flags were originally developed for realtors, whom needed a highly portable and quick-to-assemble display for open houses! 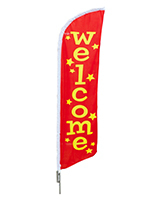 However, the "WELCOME" greeting printed on these banners can be used by a multitude of businesses to greet customers to their establishment as well! These message flags that are easy to assemble include a carrying case for transporting and storing the unit in an organized manner. Real estate agents or property managers can quickly place the bag in the trunk of a car or an office closet once done advertising with the banner for the day. A compact size of only of 48"w x 9"h x 2"d [with all components in bag] allows the unit to be stored virtually anywhere! 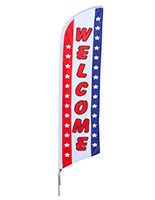 The message flags, also known as flutter banners, have poles consisting of (2) fiberglass and (2) aluminum segments, which all fit inside their own individual slots within the nylon carrying bag. A height of 8' makes the blade banners large enough to attract attention in the busiest of locations, yet small enough only one person is required for assembly. 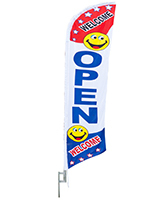 With a combination of portable design and light weight, these message flags that come with a nylon carrying case are the ideal solution for users that need an outdoor display, which will frequently be assembled, taken down, and then stored until the next showing or event. 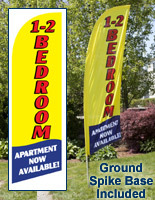 Not only are these advertising banners portable, but they are highly effective at attracting attention! These message flags have bright, bold red text written on a yellow fabric. The combination of these colors creates a colorful feather banner, which consumers will find welcoming. These outdoor displays are message flags that are made from knitted polyester fabric. When the wind blows, the ultra-lightweight fabric gently flutters in the wind to garner yet more attention from those in the area. A bungee cord attaches to both the message flags and poles to keep the pennants securely in position. 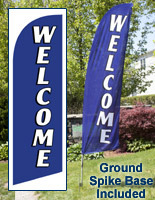 Once placed on the included ground spike base, the swooper banners stand approximately 8' tall. Users can place the message flags that are easy to assemble anywhere there is grass due to the inclusion of the ground stake with purchase. Users can repeatedly hammer the base into the ground at various locations thanks to a durable steel construction. While this feather flag has a long list of user-friendly features, it is surprisingly affordable. 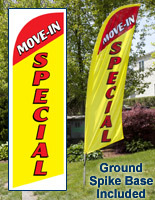 Furthermore, this flutter banner is more effective than many yard sign style displays simply due to the 8' height and vivid coloration of the design.